If a lithium-ion battery has overheated, smells, or has distended, take immediate steps for your safety. In one of the Slack teams I’m in, a colleague posted a photo of a battery he removed from a MacBook Air. He replaced the battery just fine, but one of the cells looked like it had been inflated like a balloon. I warned him to take care, and in the resulting discussion, realized it’s not common knowledge that it’s not just a defectively designed Samsung Note7 battery that can cause fires and damage. If you believe the battery in your phone, tablet, or laptop has started to expand, unplug the device immediately if it’s plugged in, and turn it off if at all possible. Don’t charge or use it at all, because lithium-ion (Li-ion) batteries that are bulging have already bypassed built-in safeguards and are swollen with gases. Continued charging or use could lead to a runaway reaction that results in a fire or an explosion. The battery cell in the upper left is disturbingly bulgy. Fortunately, it was disposed of safely. If you remove a battery and discover it’s already bulging, don’t mess with it. Put it on a surface that’s not made of flammable material—for example, stone, concrete, or ceramic. If you can find a cool place, even better. If you have an outdoor space where it’s not in the sun or hot and away from pets and children (and over-curious roommates and neighbors), that’s the best place to put it. Whatever you do, don’t puncture the cell, as tempting as this might be. It will release gasses, most of which will be carbon dioxide, but there are other chemicals and byproducts you don’t want to breathe in or expose to air. 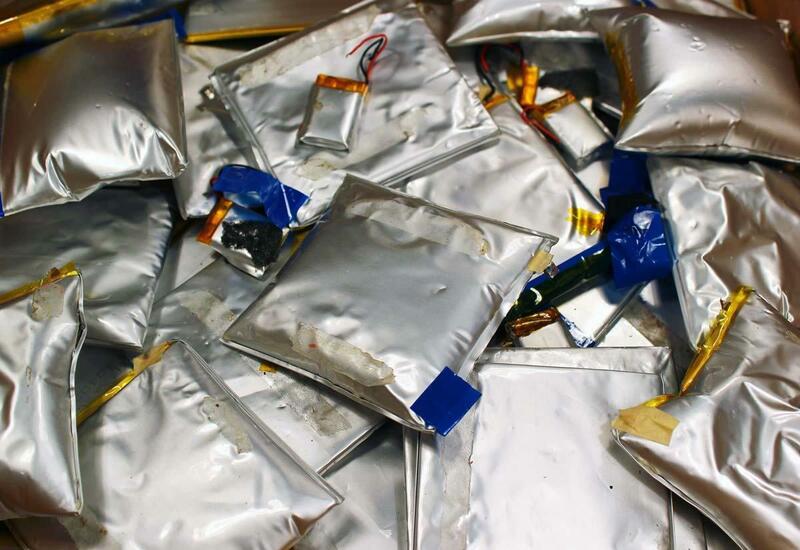 Once you’re sure the battery is in a safe state, you can take it to a number of places for recycling. It’s absolutely unsafe to put in regular garbage. If neither of those are convenient or will take the batteries, check with your local city or county for where to take hazardous waste. Seattle, for instance, relies on our county for solid-waste disposal and hazmat, and I can take them to one of the county’s sites for disposal. A national directory also can help you find places: click the Search Filter link and choose Recyclable Batteries. Call ahead wherever you go to make sure the place you’re dropping the battery off can accept a swollen battery.